Life News: Ballet Manila's Swan Lake Premieres This Weekend! It was the ballet that started it all. At 14, Ballet Manila CEO and Artistic Director Lisa Macuja-Elizalde saw Swan Lake with Prima Ballerina Yoko Morishita as the Swan Queen in all her tiny might. The encounter ignited a spark in Lisa, inspiring her to become the dancer and icon that she is today. The Filipina Prima Ballerina, now training a younger generation of swans, believes that there’s only one way to perform Swan Lake—and that is with the original Lev Ivanov choreography for the “white acts” or the first act. Acts 2-4 will be featuring choreography by Russia People’s Artist Sergey Vikulov and Tatiana Udalenkova, whom Lisa regards as her second family. 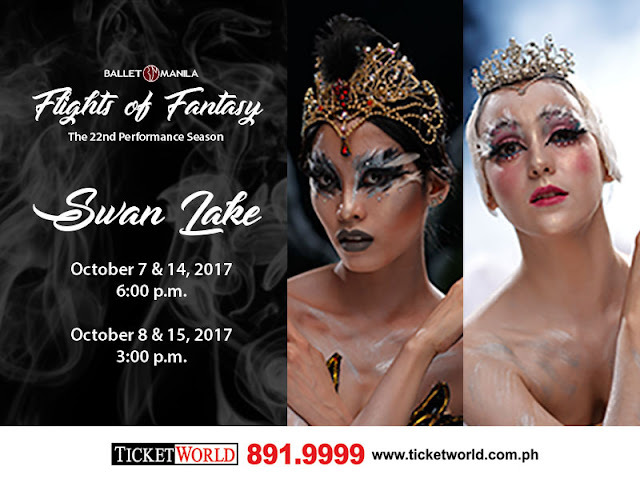 Ballet Manila’s re-staging of Swan Lake will feature a new generation of ballerinas and danseurs. Katherine Barkman, Abigail Oliveiro, and Joan Sia, who makes her debut as the black swan, will be alternating the dual role of Odette/Odile, while resident guest artist Joseph Phillips, Elpidio Magat, Romeo Peralta, Rudy de Dios, and Mark Sumaylo will be alternating the role of Prince Siegfried. The dual role of Odette/Odile is probably one of the most difficult, if not the most difficult role a ballerina to play. Lisa explains, “It not only calls for a chameleon-like change in character – but also for extraordinary technical requirements. For Odette, you need to be soft, pliant, and lyrical with an almost painful vulnerability. For Odile, you need legs and arms of steel, a fiery technique, speed, and the ability to transform into evil personified.” This demanding portrayal of the role is definitely one to look out for by the audience. To add to the magic, the production will also feature the original score by Peter Tchaikovsky, which will be played live by the ABS-CBN Philharmonic Orchestra under the baton of Russian conductor, Maestro Alexander Vikulov of the Mariinsky Theater. The haunting melodies alongside new sets and costumes will definitely make for a magnificent evening. Swan Lake’s story is one that connects with the heartstrings of the family, as it revolves around the universal theme of good triumphing over evil. From romance to the sheer beauty of ballet, it is all here. Through Ballet Manila’s rendition of Swan Lake, Lisa hopes that the company can inspire young children to work on their dreams too—just like how she did when she first saw the ballet. For more information about the shows, including ticket prices and schedules, you may visit http://www.balletmanila.com.ph or follow Ballet Manila on Facebook, Twitter, and Instagram. Tickets are also available through all TicketWorld outlets. Please call 891-9999 or visit http://www.ticketworld.com.ph for more information. In addition, those who are planning to watch all the shows may take advantage of the company’s Season Subscription Programs, which offer up to 50% discount on ticket prices. For more information, you may visit http://www.ticketworld.com.ph/balletmanila/Online/ and click on ‘View Details’ under ‘Season Subscription Program’.